The snippet below is one of the ways I attempted to require that the user fill out at least one of phone no. and/or email using webform conditionals. This one came closest to working. 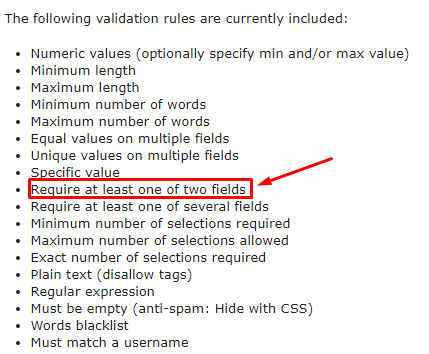 The logic is both fields default to required but that requirement clears when the other field is filled out. It fails because webform interprets it as a circular reference. Any suggestions? I don't have the technical wherewithal to attempt the answer to question 87889 so looking for a way to do this using webform conditionals. Question 63912 looked promising until I realized it dealt with Drupal fields and not Webform fields. I think it has what you are looking for. How to require one of two fields to be filled out? How can one automatically rename files uploaded in a webform?